Q. A big tree fell over in our backyard this winter. Luckily it didn't hit anything important. The main part of the tree has been cleared away. Now there is a giant root ball covered in dirt that pulled out of the ground. Instead of disposing of it, I think it would be cool to add more dirt to make a big mound and grow plants and flowers on it. What plants would grow well on a decomposing stump? 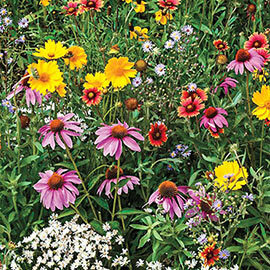 It would be nice to have flowers and plants that are beneficial to bees and birds. It's in a sunny location. This is very different from tilling something like wood chips INTO the soil; which both I and Paul Wheaton—a leading hugelkultur advocate—both warn against. Till wood chips into your garden and nothing will grow there for years! That's because mixing fresh wood with soil creates an environment where the wood is going to steal all of the Nitrogen it can to facilitate its decay—starving the plants in that bed for years, but eventually yielding increased fertility. Hugelkultur is different. And it's hugely popular; we get emails asking for more information about it every week. It's a form of Permaculture (as in 'permanent agriculture'), a style of long-term growing popularized by Paul Mollison, an Australian I got to share the stage with at a "Bioneers" Conference back in the 1990s. The specific idea with hugelkultur is to collect fallen wood that is ideally already beginning to rot. (Once wood starts to decompose it's not stealing Nitrogen.) Then you cover the wood with soil and plant perennials on it. The theory is that they'll grow better every year, never need food or water, and after 20 years or so, the wood will have completely decayed into super-rich soil. The afore-mentioned Paul Wheaton out in Montana is perhaps the best-known proponent of this technique. He's been dubbed 'the Duke of Permaculture'; and he's insanely popular on the Web. And yes, "The King of Compost" is actually buying into someone else's technique for a change. I'd like to think that I can still grow and accept new ideas; there's a lot of old wood around waiting to be used; and this technique has stood the test of time. It also has a lot of fans whose opinions I respect. My good friend Sebastian Kretschmer, a very talented Biodynamic devotee and small scale farmer originally from Germany, tells me that he feels "anything can be grown on those mounds. As the carbonaceous mass in the hole starts to rot, the fertility grows. 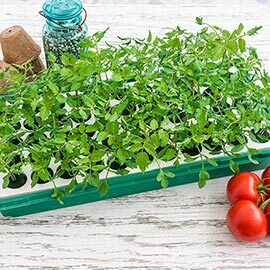 Excellent drainage and early warming soil - in some ways it's the ultimate raised bed garden." I had a great talk with hugelkultur Paul, and we hit it off right from the start; he hates wood chips more than I do, and he shuns chemicals as much or more than me. The only 'problem' here is that he prefers rotting wood, and our listener's stump is still super-fresh, which is not ideal. In traditional hugelkultur, you'd dig a little pit and fill it with a mix of fresh logs and rotting wood from the forest, which is teeming with all kinds of wonderful fungi, microorganisms and other living things. So I'm going to suggest we begin with a year of accelerated rot, either using the wood to attract pollinators, grow mushrooms or both. She could drill little holes in the wood to attract carpenter bees, and deeper holes for mason bees to colonize. And seeding mushroom spore into the stump would really accelerate the decomposition, especially if she found the right mushrooms for her specific type of tree. There's a good possibility she could grow some very useful mushrooms, either edible, medicinal or both—but even ones that are just ornamental would be really cool. Now: growing mushrooms outdoors using what's called 'plug spawn' inserted into a tree stump is going to take longer than with an indoor kit, but the 'shrooms will produce for several years in an outdoor system. If she's interested in trying to grow things like shitake or oyster mushrooms, this is definitely the way to at least start out. Then she could make one of those Permaculture mounds after a few years. Although Paul tells me he would make it tomorrow. Either way, he says to cut the wood into smaller pieces if you have the equipment, add some older, decaying branches, push it all towards the hole that the fallen tree stump created, cover it with a couple inches of soil and then plant a bird, butterfly and pollinator garden of perennials on top—maybe a fruit tree after it all settles for a few years. But he adds that if you don't have access to chain saws and backhoes, just cover the stump with whatever dirt you have and be patient. Nature loves a blank slate!